into and out of your house. The resistance is called its R-value and the higher the value, the more effective the insulation is at keeping your indoor temperatures where you want it. and cost. The long term operating costs must be weighed against the initial cost of the insulation. The types of insulation depend on whether it’s new construction or whether you’re insulating an existing building. Here are the main types of insulation used in home construction. blocks made of rigid foam. Concrete is poured into the spaces and the insulation becomes part of the structure itself. disadvantage is that it is difficult to install in irregularly shaped locations where it leaves gaps. the work themselves. It can be made from mineral wool, natural fibers or fiberglass. For tight corners and areas where rigid or shaped insulation won’t fill, blown insulation is the best choice. It allows for insulation around obstructions and is installed using special equipment. The best heating and air conditioning system in the world is powerless against a poorly insulated home. If you need help with your home’s insulation for improved heating or cooling performance, give the Certified Comfort Experts at Western Heating & Air Conditioning a call at 801-515-2448 or chat with us online at TimeForComfort.com. 1. A thorough inspection of the fan, burners, pulleys, belts, motors, heat exchanger and controls. 3. Filter replacement if needed. The first reason to keep on top of your HVAC equipment is to prevent a major catastrophe. Having no furnace in the middle of winter is like shutting down at the side of the highway. You never want to be in that situation. Preventative maintenance on your furnace reduces the likelihood of being left out in the cold. The harder your equipment has to work, the shorter its lifespan. As with any machine, wear and tear will take a toll. The inevitable shutdown happens much sooner if you keep pushing your equipment without proper maintenance. Regular tune-ups will lengthen your equipment’s life, saving you money. No matter what shape your equipment is in, it has to provide the same amount of heating or cooling on a given day. A unit in top shape will do so with less effort, using less electricity and gas to keep your home at the right temperature. A proper tune-up will allow your furnace or A/C to work without emptying your pockets to pay outrageous energy bills. Furnaces can introduce deadly carbon monoxide into your home if not maintained. A cracked heat exchanger can allow combustion gases to enter the supply air. A dirty burner can result in incomplete combustion, which in turn increases the amount of carbon monoxide produced. A professional inspection and tune-up will prevent these situations from happening, keeping you and your family safe. To keep your home’s air system working well, give Western a call and we’ll tune-up your heating and cooling equipment so you’ll be cool this summer and toasty in the winter! Call 801-375-COOL or visit TimeForComfort.com. Have you ever jumped into your shower only to be welcomed by icy water? Well, that can be explained! Here are seven reasons why your hot water is out, and how to fix it.. If water is leaking in the basement, it won’t reach your bathroom, especially if your shower is on the second floor. As long as the pipe isn’t hidden in a wall, you should be able to find the problem easily. Have it repaired immediately and everything will be back on track. This is a potential problem for gas-fired water heaters. If you don’t know how to check your heater for the pilot light, look in your heater’s manual. Follow the instructions to relight it and if it doesn’t work, you have a bigger problem that needs special attention. Electric heaters have an element (sometimes two) that heats the water. If there’s no hot water and no leak, your element might not be working. These water heaters typically have a lifespan of about 7-10 years so if your heater is around this age, it’s possible that the element has failed and needs replacement. Thermostat is set wrong or not working. Water heaters have a thermostat to set the supply temperature. It might be set too low, not giving you hot enough water to have your shower. Follow the instructions to change the thermostat setting. If it still doesn’t work, you may need to change your thermostat. Your water heater might have tripped the breaker. Check your panel and reset the breaker. If it happens again, that signals an electrical problem and you should call in a professional. You may have to replace your heater, depending on the severity of the problem. If everything is working well but you constantly face a cold shower if you’re the last one in, your heater might be undersized. You can either race to the bathroom before everyone else, wait for the water to heat up again, or replace your heater with one that has a larger capacity. Don’t take chances with your hot water system. Give the Certified Comfort Experts at Western a call to make sure everything is working well and keep your hot water running hot. Reach us at 801-224-8899 or visit TimeForComfort.com today! PS, you can get $50 off a new water heater when you call before April 5th! Many people don’t think about air duct cleaning until it is absolutely necessary. Because the air ducts are hidden from sight, it is easy to forget about them. However, nothing is more important to your indoor air quality than your duct system. To have a healthy and efficient home, you need to schedule regular duct cleaning. Through normal occupation in a home, we tend to generate a lot of contaminants and air pollutants, such as dander, dust, and chemicals. These contaminants are pulled into the HVAC system and re-circulated 5 to 7 times per day, on average. This re-circulation can cause a build-up of contaminants in the ductwork over time. Some occupants may be more sensitive than others to these contaminants. Allergy and asthma sufferers, as well as young children and the elderly, tend to be more susceptible to the types of poor indoor air quality that air duct cleaning can help address. With a professional duct cleaning, here are two of the many benefits you will experience. Contaminants in the heating and cooling system cause it to work harder and shorten the life of your system. Although filters are used, the heating and cooling system still gets dirty through normal use. When an HVAC system is clean, it doesn’t have to work as hard to keep the right temperature in your home. As a result, less energy is used, saving you money in energy bills. There are many companies out there that claim ridiculously cheap pricing for their duct cleaning. The truth is, you get what you pay for when it comes to air duct cleaning. You should never trust just anyone with the health and safety of your home. Western Heating & Air Conditioning are Certified Comfort Experts who take pride in doing a job the right way, even if it’s not the easy way. Westen has a long history of customer satisfaction. For the month of January, Western is offering a FREE duct cleaning with the installation of a new high-efficiency furnace. To learn more about the benefits of air duct cleaning or to take advantage of our January special, contact the experts at Western Heating & Air Conditioning at 801-375-COOL or visit us online at www.TimeForComfort.com. At Western Heating & Air we know that nothing is more important than the health and safety of your family. As winter time arrives and families spend more time indoors with their heaters turned up, the risk for carbon monoxide poisoning increases. This is why it is so essential that you call us early for furnace maintenance. Whether your furnace simply needs a tune-up or furnace repair service, we can be there to help keep you and your family safe and warm all season long. Each year in the United States, carbon monoxide poisoning results in 450 deaths and over 20,000 visits to the emergency room. This is particularly tragic as most of these deaths and illnesses could have been prevented. One of the reasons carbon monoxide is so dangerous is because it is completely odorless and colorless and can cause death long before you are even aware that it is in your home. Any type of fuel-burning appliance or device can give off carbon monoxide, including furnaces. To avoid carbon monoxide poisoning, every home should have a CO detector on every level of the home, and homeowners should call for furnace repair at least annually to diagnose or prevent problems (The Beacon). Take an important step towards protecting your family from carbon monoxide poisoning by calling us at Western Heating and & Air for furnace repair or service. We are dedicated to providing the quality service you can count on. Contact us at 801-375-COOL to set up an appointment today. Water heaters, like every appliance in your home, has a limited lifespan. There’s only so much dishwashing, bathing, cleaning and laundry it will do before it’s time to say goodbye. When deciding between repair or replace, sometimes replacing it is the best option. Warm water is something we take for granted until it’s not there. The most obvious sign that you need a new water heater is that it fails multiple times despite your efforts to have it repaired. You might choose to replace it the first time your water runs cold or replace parts to keep it running longer. If you choose to stretch its life and it fails you again, then it needs to go. Water heater tanks are exposed to temperature fluctuations between hot and cold water. This thermal variation causes stresses that eventually lead to cracks and leaks. While it takes years for you to see the effects, once it occurs, it’s time to replace your heater. If you have to crank the shower lever all the way just to have a lukewarm bath, your heater may need to be replaced. Despite the lower supply temperature, however, a poorly performing heater will consume large amounts of energy as it attempts to heat your water, sending your bills up. If you’re getting the right temperature coming out the taps but it takes an inordinate amount of time to reach that temperature, your heater might be underperforming and in need of replacement. If your heater bangs, sizzles, knocks, shrieks, whistles, bubbles or makes any strange noises, you need to call in a professional to assess. Causes vary from limescale buildup to malfunctioning burners and electrical elements. Your heater might pose a fire or carbon monoxide risk depending on what’s making noise. Replacing your heater becomes a safety issue if you’re faced with more serious malfunctions. Water heaters have a lifespan and if you take care of yours, it will last for many years. However, the cost saved by postponing replacement will quickly get consumed by rising utility bills. Let a professional assess its condition and advise you how close it is to its end of life. If you think it might be time to replace your water heater, call the Comfort Certified Experts at Western Heating & Air Conditioning at 801-224-8899. Our trained technicians can assess your needs, and give you the best options for your home. Visit us online at www.TimeForComfort.com to learn more. Dry Air Problems? We Have a Solution! Dry air can cause respiratory problems and increased allergy symptoms for many people, especially during the cold Utah winters. Dry air in your home can draw moisture out of porous materials like wood, including furniture, woodwork, wood floors, pianos, and other musical instruments. It makes the air temperature feel cooler than humidified air so you might find yourself setting your thermostat higher to reach the same comfort level. Once a whole-house humidifier has been installed on your forced air furnace system, you can set the humidity level and forget about it. A whole-house humidifier operates with a hygrometer to measure the humidity level, and it automatically humidifies the air as your furnace warms it, distributing it to every room through your ductwork. A whole-house unit monitors the humidity level, adding moisture only when it is needed and limits the level of humidity to the setting you select. Many room units do not have regulators to stop the humidification process when the proper humidity level has been reached. Too much humidity can increase mold, mildew and dust mites. In a room humidifier, the water tanks and other parts must be cleaned often to prevent mold and bacteria buildup. 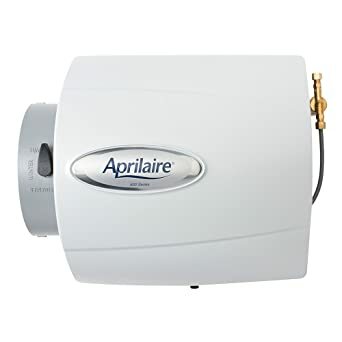 In contrast, a whole-house humidifier will need cleaning once or twice a year to remove white dust mineral deposits left by the evaporated water. A simple water filter exchange is usually the only maintenance necessary. Technicians from Western Heating & Air Conditioning change those filters regularly as part of their annual maintenance routine on the heating equipment. The even humidity level maintained by a whole-house humidifier keeps the air you breathe healthier, no matter which room you are in. Dry air can aggravate sinus problems and cause nose bleeds, and it can encourage the spread of some viruses that cause respiratory illness. Humidified air can help reduce snoring for some people, and it reduces chapped lips, dry throat, static hair, and dry skin. Humid air feels warmer than dry air at the same temperature. Western Heating & Air Conditioning recommends adding a whole-house humidifier to your furnace. The humidified, heated air allows you to keep your thermostat set several degrees lower while you enjoy the same comfort level throughout your home. A lowered thermostat helps you save money on your heating bill. Room humidifiers need expensive distilled water to operate at maximum efficiency. A whole-house humidifier is plumbed into your household water system, so you never need to purchase special water. It may only add a few cents per month to your water bill. When it comes to comfort, temperature is only one part of the picture. The amount of moisture in the air is just as important. Getting humidity right affects your real comfort levels but more importantly, it affects your health… and nothing is more spooky than an awful, yucky cold! How much humidity should you aim for? The ideal range is 40-50% in the summer and 30% in the winter. The slightly lower target in winter is to prevent condensate from forming on cold windows. Typically for the colder months, low humidity is the issue since cold air holds less moisture, especially in an already dry state like Utah. Static build-up is one of the first things you’d notice when the humidity drops. While this might be ok for Frankenstein, getting small shocks when you touch metal, and static-charged hair can bring some discomfort. However, for your expensive equipment and devices, static electricity can actually lead to damage. Dry skin and membranes: Low humidity causes the dreaded “winter skin” which can become zombie-like and painful as your skin cracks and opens you up to infection. Not only does your skin dry out, but so do your nasal membranes. This increases your susceptibility to colds and other respiratory illnesses. Damage to furniture and your home’s structure occurs if the air is so dry that it removes moisture from wood. Your floors may begin to creak more and your doorways might warp slightly. This is something that happens over time so you may not notice it right away but to keep your home from appearing and sounding haunted, you need the right humidity. By far the best way to keep your humidity levels up in winter is to use a humidifier. You can use a vaporizer or install a humidifier in your HVAC system. Regardless of what you use, remember not to let the air get too humid because this comes with its own frightening problems. To get the right amount of humidity in your home, the first step is to have a humidifier that’s the right size. A professional knows how to calculate the required pounds per hour (lb/hr) of moisture or steam to be added to the air. The amount of moisture needed is based on the temperature of air entering the furnace (a mixture of outdoor air and return air from your home) as well as relative humidity. Moisture is added to get humidity levels up to where they should be. Having a humidity sensor ensures you never go too high or too low with humidity levels, and that’s a spell that you don’t want to miss out on. Keeping your home cool in the heat of summer can be a challenge. You’re sure to lean on your A/C to help your home stay as comfortable as it should be when the weather outside is extremely hot. Knowing some of the most common A/C problems that you may be forced to deal with may be helpful to any homeowner. It’s important to get the most out of your A/C by keeping it tuned up at least once a year. There are a number of things that will be done during this process that may include checking the electrical components of your unit, cleaning the condenser and making sure all of the coils are clear and free of debris. One thing that frequently occurs during the summer is refrigerant leaks. This can prevent the air in your home from getting as cool as it should be. Freon is the necessary component that helps get the air in your A/C unit as cool as you want it to be. It’s necessary to check to ensure there is enough of this in your unit and leaks can decrease the necessary amount. It’s important to help your A/C unit run efficiently as it should to keep a fresh air filter in place at all times. When these get overly dirty or clogged because they haven’t been changed, this can prevent the air in your home from getting as cool as necessary. Take the time to change the filter at least once every three months for optimal results. We want to help you keep your home as cool as you want it to be. This means addressing any A/C problems as they occur to help you enjoy a cool home when the weather is out outside. Be sure to visit TimeForComfort.com or call us at 801-375-COOL and schedule an appointment with us! What Do You Mean There’s No Hot Water?! Believe it or not, tankless water heaters have been around for a long time. In 1868, a painter from England named Benjamin Waddy Maughan invented the first tankless water heater called the geyser. It used hot gases to heat water flowing through a pipe and into a tub. Today tankless heaters work in a similar way but with added features like flue gas exhaust. Tankless heaters can be installed centrally to provide hot water for the entire home or they can be installed at the point of use for a fixture or group of fixtures. They are sized based on the fixture flow rate and have a higher energy input than tanked equivalents because of how quickly the water is heated. 1) You save energy by not having to keep 60 gallons of water hot all day while the house is empty. Tanked heaters also have losses through the tank walls, further adding to the energyconsumed. 2) There’s no wait time for water to reach the right temperature in a tank. Water has a high heat capacity, which means that it needs a lot of heat to raise the temperature by one degree. In a tank situation, this means time waiting for the water to heat up if you happen to be the unfortunate one who gets in the shower last. Tankless heaters eliminate this problem by heating the water to the right temperature while it flows to you. In addition to eliminating the wait times for heating a tankful of water, there’s no limit on how long you can run a tankless before the water gets cold. So even if you just finished a full load of laundry and need to wash the dishes, you’ll always have the hot water you need. 3) Tankless heaters are smaller and take up less room than tanked heaters. So if space is tight, you can reclaim an average of ten square feet of your home’s floor space for other important items. 4) They last longer than tanked heaters. Typical tankless heaters have a life expectancy of 20 years as opposed to the 10-15 years of tanked heaters. If you want to find out whether tankless is ideal for you and to assess how to make it work for your family, give us a call and we can help you get these benefits with special pricing! Do You Need All That Stuff? Is your home cluttered? If so, it’s probably causing you some problems. This spring, make an effort to clear out the mess that’s harming you and your family. Items on the floor can cause slipping and tripping while items on tables and other surfaces can fall off and become tripping hazards. Excess clutter creates hiding spots for vermin. Just because you don’t see spiders and cockroaches doesn’t mean they’re not there. Too many items in your mechanical room is dangerous. It might seem like a convenient storage area but clutter can inhibit airflow to your furnace, increasing the risk of carbon monoxide production. Decluttering has psychological benefits too. You’ll be able to focus better. Fewer distractions in the form of a mess to clean up and things left undone. Each trinket takes up space in your mind as well as physical space in your home, distracting you from important tasks and creating stress. You’ll save time because you’ll be able to find everything you need faster. Once everything has its place, you won’t waste time searching for important items. Set aside a block of time. Depending on how much you have to sort through, it will take time. Take one space at a time. This might mean a room or just one cupboard or closet. It’s easy to get overwhelmed when you survey your entire house so break it down into small chunks. Sort into three piles: “Keep” (for things you use regularly), “Discard” (this includes items to donate or throw away) and “Unsure”. This last pile is to prevent you from wasting time with indecision. It keeps the momentum going so midnight doesn’t come and go with everything still strewn across the floor. Pack your “Keep” items away in specific spots so you have easy access to them. Deal with sentimental items separately. Put them in the “Unsure” pile to start with. Have a box or chest specifically for sentimentals and make sure that everything fits into this one box. As new items are added, discard something else. Actually get rid of your “Discard” items. The whole point of this is to make space, remember? Create a system for dealing with new items entering your home. Maintenance is the hardest part. Without a plan that you can easily follow to keep your home clear, more “stuff” will migrate into your empty spaces and pile up again. If part of your decluttering means clearing out your mechanical room to keep you and your family safe, give us a call and we can help you figure it out! For some climates, you need to leave your heat on from October to April (or May!). For others, summers are brutal and for health reasons, your air conditioner should stay on. In most cases, though, there are times where leaving your equipment running is optional. The question is: should you? 1) You don’t have to wait for the temperature to reach where you want it. Your home will be a consistent temperature throughout the day with more opportunity to even out throughout the house. 2) During summer, your air conditioner takes care of humidity as well as heat. Leaving it on keeps your humidity within reasonable limits and doesn’t overburden the unit if you leave it off for a long time then put it on. 3) You may be tempted to turn off the heat to save energy on a mild winter day, or if you’ll be away for a while. This can lead to frozen pipes if the temperature drops unexpectedly. Leaving it running keeps your home safe from too-low temperatures. Turn down your thermostat to a minimum of 50F to save on energy without the risk of freezing. 4) Forced air systems have the option of running the fan continuously, even when heating or cooling isn’t required. This circulates the air continuously, passing it through the filters and improving indoor air quality. 5) Another reason to have your fan run continuously is to provide better temperature distribution throughout your home. Constant air movement mixes air throughout your home. This prevents stagnant air pockets from forming and giving you unpleasant hot or cold spots. 1) While your system draws more electricity during ramp up, it also consumes more power if left on 24/7. Leaving your system running continuously results in more energy consumption overall. 2) Most residential air conditioning systems use a refrigerant. Peak efficiency for these units is close to full load. So when the air conditioner is working hard to lower your home’s temperature, its efficiency is high. If you leave on the air conditioner to maintain your home’s temperature, the unit’s efficiency falls. Ultimately this adds to your summer energy bills. 3) You’ll see quicker wear and tear on parts. This translates into higher maintenance costs and a shorter lifespan. 4) When your fan runs continuously, it passes more air through the filters. Because your filter is taking care of more air, it clogs faster and needs replacing sooner. Whether or not you decide to run your A/C or Heating equipment continuously, you need it working well. Give us a call at 801-375-COOL to make sure your unit is at peak performance! Dirty filters will cause your fan to work harder to push air throughout your house. Replacing filters regularly will help prevent a fan from overworking and breaking down. Dirty blowers also have to work harder to push the same airflow. Motors can burn out if not maintained. Start with a visual inspection to make sure there’s no sign of rust or debris. Check the fan belt to make sure it’s not too loose. If the blower makes noise when it’s on, call a professional to do a more thorough inspection. Clean your burners to make sure they work at maximum efficiency. Observe the flame color, which should be blue. A yellow flame indicates poor combustion producing toxic gases like carbon monoxide. Verify that all burners are working and have faulty burners replaced. When a furnace burns gas, the heat is transferred to the air blowing throughout your house using a heat exchanger. Over time, this component can corrode, placing you at risk for flue gases entering your home. Do a visual inspection for signs of corrosion and if you see evidence of holes or cracks, call in a professional to replace it immediately. Make sure your furnace comes on and responds when you turn your thermostat up or down. It should come on when you increase the set point above the room temperature and should turn off when the temperature reaches the desired set point. A furnace that fails to come on and off when needed can also have a faulty onboard control system. Have a technician look at both your thermostat and the furnace itself. There will come a time when maintenance and repair won’t be enough to keep your furnace going for the entire winter season. Consider upgrading if gas usage climbing despite milder weather or efforts to use less heat or if you find yourself spending more and more time and money on repair. Give us a call at 801-375-COOL to keep your furnace in shape so you don’t have to face a freezing night this winter! Utah’s Most Wanted Techs at Western Heating & Air Conditioning are ready to help. Visit us online at TimeForComfort.com to learn more. As a home owner, the time will come when you will have to decide whether you should repair or replace your furnace. You may wake up one freezing, cold morning with a broken furnace and hope that it only needs a minor fix. Unfortunately, some problems are much larger than expected. When faced with a decision to repair or replace your furnace, it can be a tough financial decision to make. Western Heating & Air Conditioning knows what it’s like to be in those situations and we want to help make your decision an easy one. Here is a real life example of a family in Eagle Mountain who faced the dilemma to repair or replace. Customer’s challenge: The Cook family own a home in Eagle Mountain. For days they noticed their furnace was making a quiet, yet high pitched sound whenever it turned on. It ended up breaking down and that’s when they knew they needed to call Western Heating & Air Conditioning. They had only lived in this home for a year and didn’t know anything about the furnace. They plan on moving and selling the home in a few years. Western’s solution: One of Western’s Most Wanted Technicians was sent to visit The Cooks to see what the issue could be. At first glance, the technician could tell the furnace was old and not properly maintained. He saw that the furnace was 17 years old and noticed there were small cracks in the heat exchanger which could potentially leak carbon monoxide. The blower motor bearings had gone out due to old age. The older furnace had not been properly maintained, and a large amount of the gas used to heat the home was going to waste. Final Results: The technician let the Cooks know that the best solution would be to replace it now. The technician then showed them where the cracks on the heat exchanger were located. That was all the Cook family needed to see to know that replacing the furnace would be the healthiest, cheapest choice for their family and the future owners of the home when they sell it. ** REMEMBER THIS: Most furnaces last 15-20 years IF they are properly maintained. Annual maintenance can save hundreds, sometimes thousands of dollars over the years on your utility bills, and fewer if no repairs. If your furnace is over 10 years old and it has not been maintained yearly, call Western to have us thoroughly check, clean and tune up your unit. It’s better to catch potential problems than neglecting it and having to replace your furnace earlier than necessary. If you’re considering replacing your furnace or your furnace is in need of repairs, give us a call and we can help you make the best choice for your home, family and budget! Visit us at TimeForComfort.com or call 801-921-5250 to schedule an appointment! To get the right amount of humidity in your home, the first step is to have a humidifier that’s the right size. A professional knows how to calculate the required pounds per hour (lb/hr) of moisture or steam to be added to the air. The amount of moisture needed is based on temperature of air entering the furnace (a mixture of outdoor air and return air from your home) as well as relative humidity. Moisture is added to get humidity levels up to where they should be. Having a humidity sensor ensures you never go too high or too low with humidity levels, and that’s a spell that you don’t want to miss out on. 1. Lower cost over time. When you maintain your equipment, the repair cost tends to be lower, and failure happens less frequently. Your equipment operates more efficiently when well maintained, saving money on operating costs like your utility bills. This may also reduce the pressure on emergency funds for sudden breakdowns and repair. 2. Peace of mind. Besides saving you money, regular maintenance will reduce the chance of you getting stuck in the heat with no air conditioning or taking cold showers for days while your water heater is being replaced. A maintenance agreement will also lengthen the lifespan of the components in your equipment. This postpones replacement and allows you to maximize the use of your equipment. 3. Keeping Your Warranty. Some manufacturers won’t replace a part if the unit has not been maintained by a professional. Rather than having to remember to book and keep up with maintenance yourself, having an agreement in place ensures that you keep the added protection of a warranty should your parts fail. 4. Relationship. You can count on your regular service company who will want to keep your business rather than one-off servicing by a stranger. If there are any ongoing issues, a maintenance agreement will provide you with better follow up on work done. The technicians who take care of your home will also become familiar with how everything works and will be better able to make suggestions and pick up on issues early on. 5. Safety. For routine maintenance, you may be able to take care of it yourself. You might even be tempted to do more complex maintenance on your own. However, a professional will know the safest way to carry out the work. Protect yourself and your family by having a professional do regular, planned maintenance on your equipment. Get your home’s maintenance in order. We invite you to find out more about Western Heating & Air Conditioning’s maintenance agreement for your heating and cooling equipment which is called the Monument Club. In addition to the benefits listed above, we also give you priority service, and discounts on all repairs, services, and new equipment. Utah’s Most Wanted Techs from Western Heating are ready to help! Find out more at www.TimeForComfort.com or give us a call at 801-921-5250. Why become a member? Click HERE to learn more! Hey Moms and Dads! We know your kids are getting ready to head back to school and you want to keep them healthy and protected from all the harmful viruses that are easily spread. We can’t always prevent illnesses from spreading at school, but there IS something you can do in your home to prevent them from spreading to the rest of your family. Have you heard of an Air Scrubber? An Air Scrubber releases positively charged particles into the air, and creates a peroxide – just like trees do in nature. These oxidizers can kill viruses not only in the air, but also on surfaces. It’s a very proactive technology that attacks harmful particles before they attack you! To find out how this revolutionary system has helped many families stay healthy and protected from harmful particles and viruses found in the air and on surfaces, CLICK HERE. Western Heating & A/C is always looking for ways to give back to our community. Earlier this summer, FM 100 teamed up with Western Heating in search of a family in need of a new AC for the Coolest House on the Block contest. The contest was designed to award a “cool” person that had helped or served in the community with a new central air system. The nominations came pouring in! On July 20, we joined up with FM 100 to surprise our winners, the Fisher family. Watch our LIVE Facebook feed with FM100 as we surprised the Fisher family with the new A/C! In Utah, we have had one of the hottest summers with severe heat waves. With streaks of hot weather averaging above 90 degrees since the beginning of June, you are probably already feeling some of the effects of the extreme heat. Not only will you feel the effects when you take the kids to the park, but your air conditioner will experience it while you’re cooling off at home. Air conditioners are a type of “heat pump”. That means they transfer heat from one place to another (from inside your house to outside). Normally, heat travels from a hotter area to cooler area so it naturally enters your home on a hot day. The air conditioner works to remove this heat and discharges it to the air outside. The hotter the outdoor temperature, the harder your AC has to work. One of the effects of high heat is a drop in efficiency. Your air conditioner efficiency drops when it has to work harder to cool your home, costing you money as your electricity consumption rises. Since your air conditioner has to work harder and longer, it’s inevitable that the lifespan of the unit will be reduced. Moving parts like the fan motor and compressor components burn out quicker and your AC needs more thorough maintenance to reduce and postpone total failure. To help improve your air conditioner’s performance locate your outdoor air conditioner in a shady area, preferably with trees nearby, and that will allow it to run at a cooler temperature than the surrounding air. Setting the temperature inside your home to a slightly higher temperature, like 76°F (24°C) instead of the usual 72°F (22°C), will allow your unit to work less. If it’s still too warm, combine your air conditioner with other means of cooling, like a standing fan or ice packs. If your unit is close to its end of life, consider replacing it sooner. You will have the benefit of a unit that’s more efficient and will reduce the risk of sudden failure on the hottest day. Give us a call at Western Heating & Air Conditioning if you need us to assess whether your air conditioner can handle the heat this summer. Utah’s Most Wanted Techs are ready to help keep you cool during the worst of heat waves that are yet to come. Visit us online at www.TimeForComfort.com or give us a call at 801-921-5250.